Jay Tholen is going from making an adventure game about a grotesque but lovable clown to a '90s internet simulator in which you'll browse the weird web and "[keep] the internet clear of wrongdoers, with reports and rewards coming direct from the Hypnospace Patrol Department to your inbox." Somehow, it all makes sense. 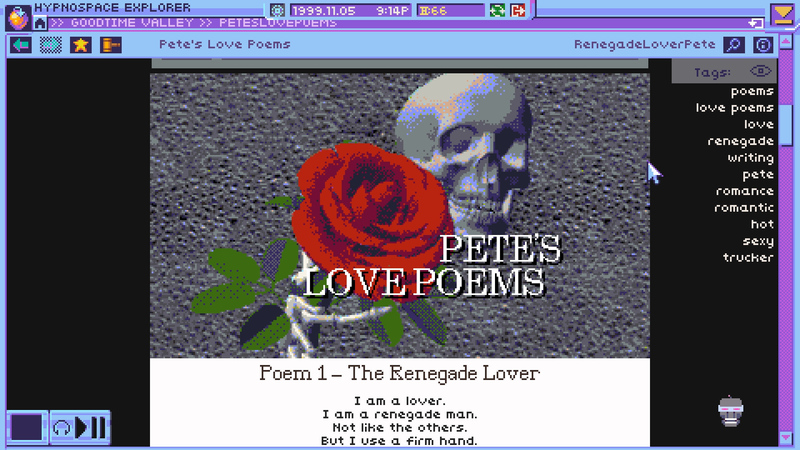 I think Hypnospace Outlaw will draw out long-dormant memories for a lot of us. It's also going to be a game that comes down to the little touches, something it already seems to excel at. One of the bullet points is that you can "wiggle your mouse pointer around to make pages load faster." Perfect. Expect this to drop in "late 2018" for Windows, Mac, and Linux.